Cassidy's model for the statue, as shown at the Manchester Academy of Fine Arts exhibition, 1898. The final work showed pages - cast in lead - in his hand. 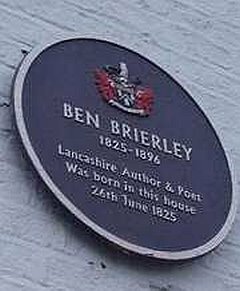 Ben Brierley (1825-1896), son of a hand-loom weaver, wrote poems and stories in the Lancashire dialect style, became a journalist and founded his own magazine Ben Brierley's Journal which was published from 1869 to 1891, and served on Manchester City Council. Brierley wrote many tales about his character Ab O'th' Yate, many set in the fictional rural area he called Daisy Nook. Brierley asked his friend Charles Potter, an Oldham artist, to draw an imaginary place called Daisy Nook. Potter came to nearby Waterhouses, a rural part of Failsworth, to complete his drawing - and from then on the area was known as Daisy Nook, and is now officially Daisy Nook Country Park. We returned to Failsworth in 2012, by which date the railway station has become a tramway station, to view what had been mentioned to us as a possible Cassidy work. It was erected in 1923 to commemorate 235 Failsworth men lost in World War I, but details of is origin are obscure. It was renovated and re-dedicated in 2007, which explains its fine condition. The 'winged victory' resembles the much larger version used by Cassidy on other memorials. We can find no direct record of a Cassidy connection in this case, although the designer is said to be 'Mr Sellers of Manchester' - James Henry Sellers, an architect who worked with Cassidy on memorials including Skipton and Heaton Moor. We are inclined to accept this as a Cassidy work. Much of our information here comes from the excellent book Ben Brierley, 1825-1896, by David Huk, published by the indispensable Neil Richardson in 1995. Many thanks to both of them. Acknowledgements as always to Terry Wyke, whose book Public Sculpture of Greater Manchester (Liverpool University Press, 2005) is the authoritative work on its subject. 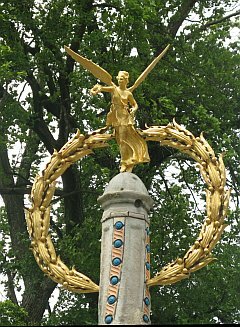 Thanks are due to Geoff Archer, author of the essential book The Glorious Dead: Figurative Sculpture of British War Memorials (Frontier Press, 2009) for alerting us to the war memorial. Website created and compiled by Charlie Hulme and Lis Nicholson, with the invaluable assistance of the John Cassidy Committee, Slane Historical Society. Of all Cassidy's major works, this one has perhaps suffered the greatest humiliation. Created over the few weeks from February to April 1898 from a five-ton block of white Portland stone, a material which the statue's sponsors apparently thought (mistakenly, as it turned out) would be immune to the polluted atmosphere of Manchester, it was unveiled by George Milner on 30 April 1898. It was approximately 2.36 metres high, and stood on a pedestal 2.44 metres high. Brierley had died in 1896, and Cassidy, who had met him only once, had to work from photographs. 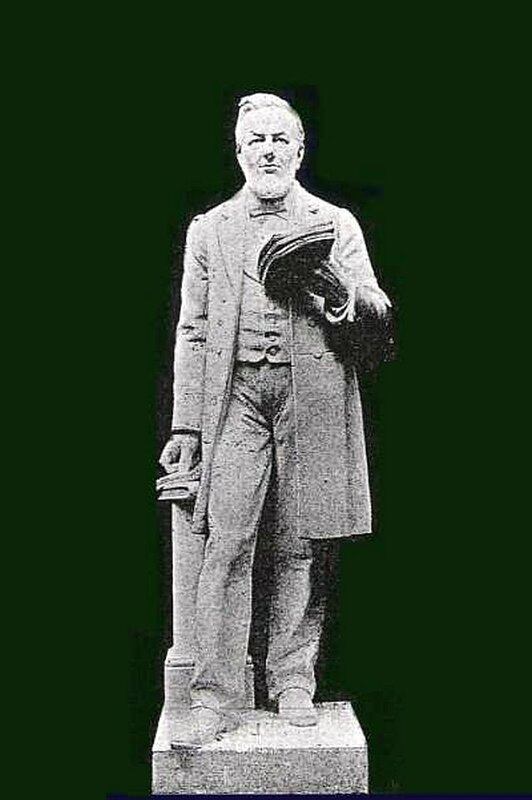 It was generally agreed, however, that the statue was an excellent likeness, and featured the man in characteristic pose in the act of giving one of his public recitals of dialect poetry. The cost of £350 was raised by a committee chaired by George Milner, the president of the Manchester Literary Club, and there were many small donations from the working people who had seen him as their literary hero. 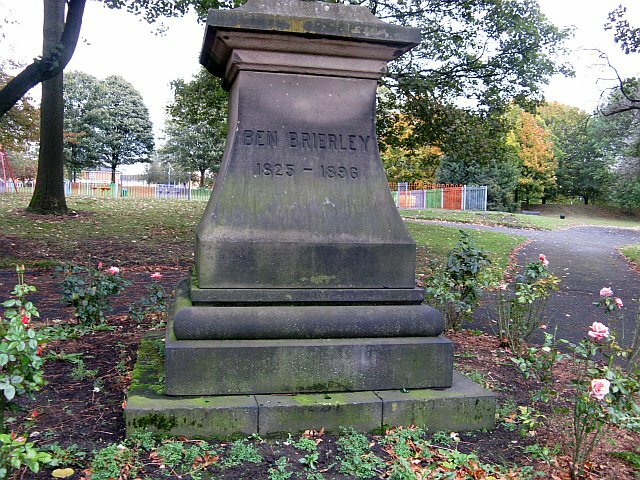 Sadly, despite bring a 'working-class hero', Brierley was not so revered by the local people as time passed. The lower left arm and the sheets of lead representing paper were missing by 1977 when a Ben Brierley celebration was held in Queen's Park, and late one night in the summer of 1980 (some sources have different dates) the statue was 'pulled down by the use of ropes' from its pedestal, breaking into pieces. Later, the fragments were stored in the boathouse in Heaton Park, where they suffered even more damage in an arson attack on the building. Reportedly, the contractors clearing up the damage, failing to realise what they were, sent the remains to be dumped; all attempts to recover them have failed. 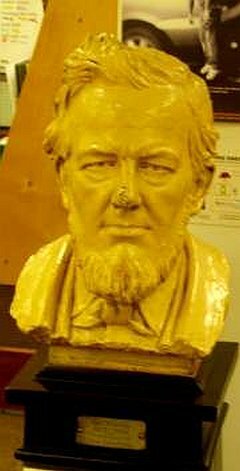 There are people in Failsworth, birthplace of Ben Brierley, who care about preserving his memory, and I travelled there on a rainy day in January 2008 to see what had been achieved. The view above shows the old houses known as 'The Rocks' next to the bridge over the Rochdale Canal which have survived even though the bridge has been very much enlarged and the road widened since Brierley's time to carry the heavy traffic on the Manchester - Oldham Road. Brierley was born in the further of the white buildings in the distance; you can see how these houses have been rebuilt at some time with an extra floor to bring their front doors to the level of the road instead of the canal towpath. The same row from the other direction and the other side of the busy road, looking from the top of the bridge. 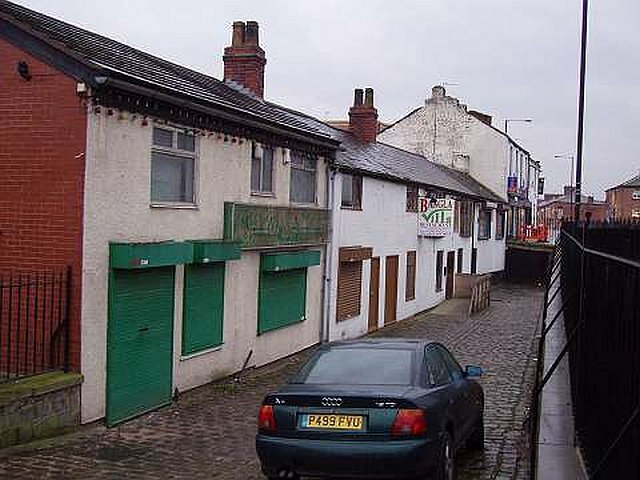 The white building on the right, 466 Oldham Road, between the Bridge Inn and the cycle shop, locates Brierley's birthplace, marked by a stone plaque placed there by a previous owner, and more recently by an official blue version, unveiled by the mayor of Oldham, in which Greater Manchester borough Failsworth now lies, in his centenary year of 1996. The brick-built clock tower in our pictures is the Failsworth Pole, marking the next point of our walk. A pole has been a traditional adornment of the town since 1793, several successive Poles having been blown down in gales before the current version, comprising a shorter pole than before, on a brick base, was erected in 1953 to celebrate the Coronation of Queen Elizabeth II. When funds became available through a European Union grant and the Government’s 'Housing Market Renewal' programme to improve the area, the plans included a statue inspired by the lost Cassidy version, and Staffordshire sculptor Denise Dutton was commissioned to create the work, this time in Bronze. The statue is opposite the Pole, fronting a pleasant garden. It was unveiled on 14 June 2006: the Failsworth Historical Society published an interesting booklet to mark the occasion, which can be downloaded as a PDF. 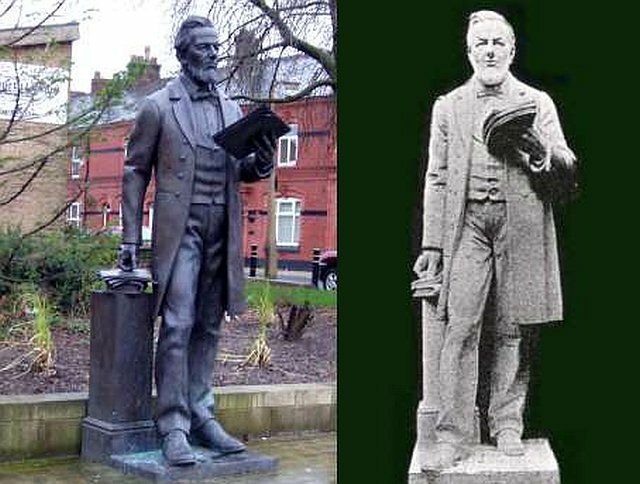 Above is our picture of the statue in 2008 with Cassidy's statue for comparison on the right (shown here at the same scale, although the Cassidy was rather larger.) Ms Dutton, whose main speciality is equestrian statuary, has done a fine job, working from photographs, and also from the surviving Cassidy plaster head. 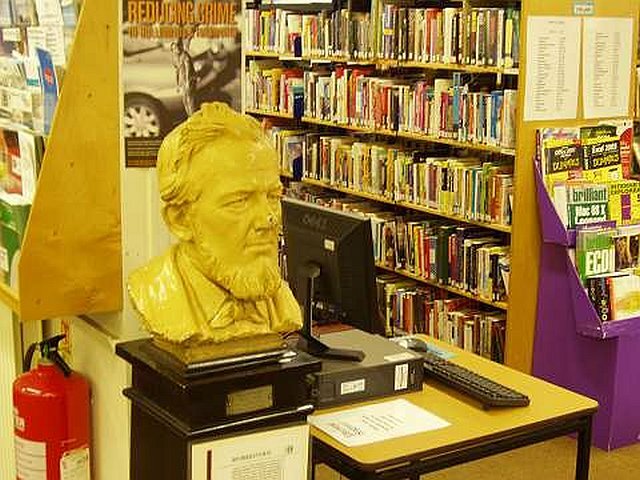 In the library I found the bust, surrounded by books, as Brierley himself surely was, and modern computers which I'm sure he would have welcomed when slaving over the production of Ben Brierley's Journal. It had suffered some mistreatment over the years ('chewing gum in the eyes, rude remarks on the forehead' according to David Huk), but has lasted well considering its history. 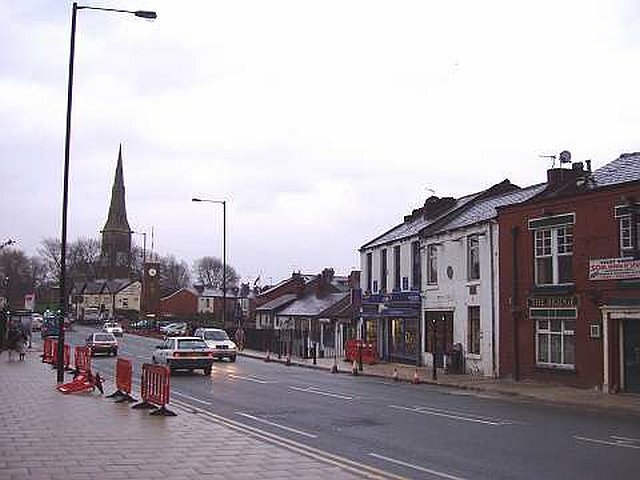 As for me, I made my way back to the station after a successful trip, feeling rather sad that Failsworth, like to many towns, is dominated by road traffic. Oh yes - and if you go to Queen's Park, you can still admire the original plinth. This page updated by Charlie Hulme, January 2019.